Hands and Knees | pop mitzvah! TV column penned midway through Mad Men Season 4 (which is of course the best season to date. No. Shut up. Shut up. You’re wrong. It’s the best season. Stop talking). Incredible performances all around, especially from Jon “I Taste Good with Everything” Hamm. It’s been less than a minute since I watched the conclusion of Mad Men’s most recent episode, and I’m already itching for a vodka tonic and a Lucky Strike. AMC’s sharp-yet-atmospheric period drama is as addictive as the vices it so often features. Tonight, ruminating on the explosive “Hands and Knees”, the tenth episode of season four, I’m interested in this question: how can a show set in the 1960s feel so urgent and relevant? Why are Mad Men fans (including us fresh-faced youths) so hungry for an authentic taste of the past? The show itself, a deep character study of Madison Avenue ad executives and their families during the most turbulent decade of the 20th century, was picked up by niche cable channel AMC in 2007, marking the launch of the network’s first original series. the reason given was that creator Matthew Weiner was completely devoted to quality over mass appeal. Story arcs are worked out in full before a season starts filming, and pre-production meetings for every episode take hours: what type of fedora was worn in winter 1964? How much did a newspaper cost? What was the public perception of John F. Kennedy during his candidacy for president? Every historical detail is ironed out with absolute precision so the viewer knows he or she is not only getting an accurate lesson about 1960s America, but an intimate portrait of the world our parents were born into. Part of the fascination Mad Men breeds lies in the commonalities we can see between our lives and the lives these characters lead. Protagonist Don Draper is a self-made success who scrambled up the corporate ladder and out of his harrowing beginnings as a destitute farmer’s son; the myth he embodies, the cliche of the American Dream, is the exact same one we are fed in 2010 as we vie for success and satisfaction. Don exemplifies, too, the inevitable dissapointment that comes with the realization of that dream. His perfect family lies in tatters due to his devotion to his image; he loses his sense of security the better he competes in the business world; he is ignorant of important social developments unless he himself is directly affected. Mad Men makes it clear, through thousands of sensitive and subtle moments, that entering the status quo and gaining prestige within the system has a cancerous effect on the soul. Fifty years later, we still struggle with the choice to be liked or to be true, to participate or to subvert. Mad Men also studies the other side of that coin, i.e. the gigantic chasm between the 1960s and the present. How far has our nation come since the decade which brewed the civil rights movement, millions of restless housewives, and the first whispers that cigarettes might be kind of deadly? The show constantly confronts us with these issues, presenting simple dialogues that challenge the viewer to consider their stance on problems which haunt our cultural landscape. In one of the show’s very first episodes, an intimidating doctor tells his female patient (as she lies on the table, timidly requesting birth control), “I don’t want you turning into some sort of…” he smirks, “strumpet.” How does this unfair power balance and blatant sexual subordination strike you, modern female audience? Are you amused because doctors are surely less judgemental in this day and age? Or are you dismayed because you feel a pang of some deep, familiar hurt? 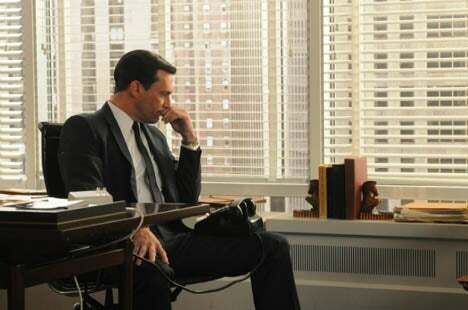 Above all, Mad Men is worth watching for the engrossing stories and painstaking attention to tone and detail. The episode I began by mentioning, “Hands and Knees”, is a wonderful illustration of Mad Men as high art. Even when the plotlines tangled into a shitstorm of a panic attack, a ruined four-million-dollar deal, and unwanted pregnancy, every moment was rendered with tenderness and a cinematic eye. I was alternately howling with shock and sighing with empathy, drawn into the lives of characters who remain normal, nuanced individuals despite their greed and ambition. Mad Men is a world in which pain sometimes comes without reward, in which despair is laced with unexpected humor, in which the mundane sometimes means the most. In other words, Mad Men is a lens on life in every decade. As Don Draper once mused about advertising, we yearn for “any excuse to get closer.” What are you waiting for?